Ever since I have got back into the fiber arts, I have really been sad that we had to move my loom out of the house for a while. Until one of these kids move out, we just don’t have room for it in here. I really have had the urge to weave so bad though, and I have been looking at various looms online. I have requested a rigid heddle loom for Christmas, and I am keeping my eyes on the Craigslist and Facebook sales pages for my area, in case a smaller loom becomes available, but that doesn’t fix my “I Must Weave NOW!” urge. So I started looking at pin looms. Pin looms are small hand held looms that you wrap with yarn in three layers and then weave the last layer. You can find the vintage Weavette and Jiffy looms on Etsy or EBay, but Schact has released it’s own version of these little looms called the Zoom Loom, and ultimately, that’s how I decided to go. I had read that Schacts design made the little loom easier to use because of the scooped out edge on the inside of the loom that helps you get the weaving needle in the correct place. That seems to be true. That little scoop catches the needle and slides the needle up to the pins. I can see that if that piece of plastic was squared off it would be hard to get the needle to make that little step to get to the pins, as the weaving progresses. There are lots of resources for using pin looms, because they were very popular in the 40’s and 50’s. There were many pattern booklets that can now be published for free on the internet because the copyright has expired, I suppose. One of the sites that I like the publishes these PDFs is eLoomnation I love the booklets that have different weaving patterns. Some of the clothing patterns are outdated, but might give adventurous fiber artists a jumping off point. Another site that has a lot of information about weaving with pin looms is Adventures in Pin Loom Weaving. Talk about just a treasure trove of information! I read a little bit there everyday as I try new patterns and techniques. So far, my favorite yarn for weaving on the Zoom Loom has been hand spun. 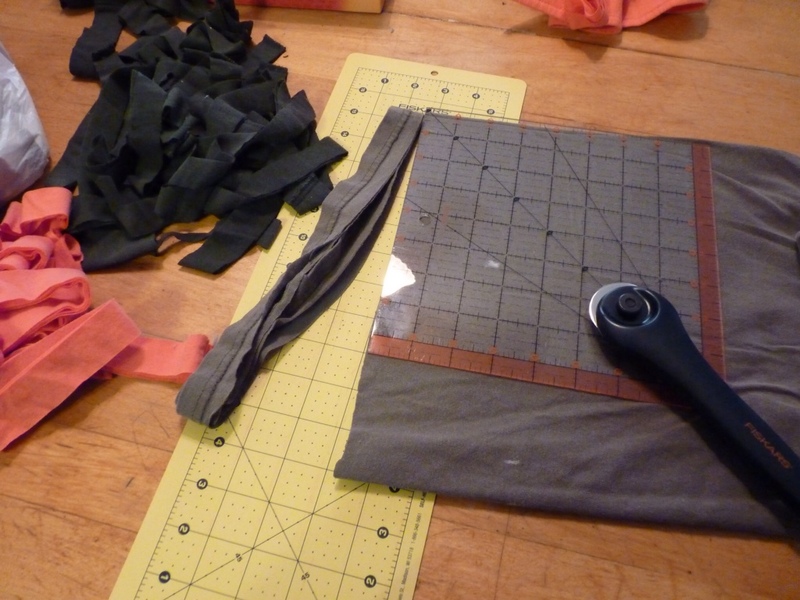 It is perfect for using up small bits that I made while sampling different fibers and blends. My absolute favorites were a Gotland 2 ply and a Gotland/Angora blend 2 ply. Both wove up just beautifully into the most wonderful little squares. The least favorite so far has been a square I wove using a commercially produced cashmere that I got from deconstructing a sweater. 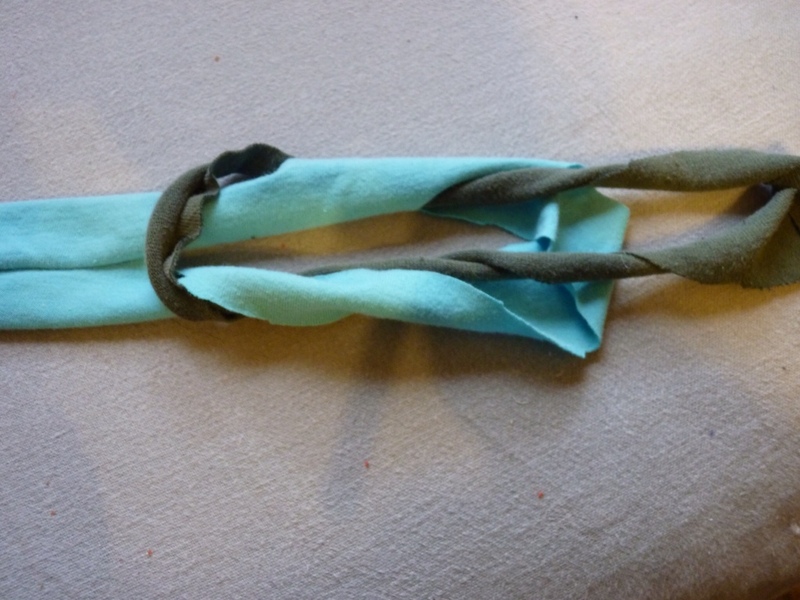 It is two thin singles held together and knit as one. I had to double that to get close to an appropriate weaving weight, and it was still very delicate, and you had to be very careful that the weaving needle caught all the threads. 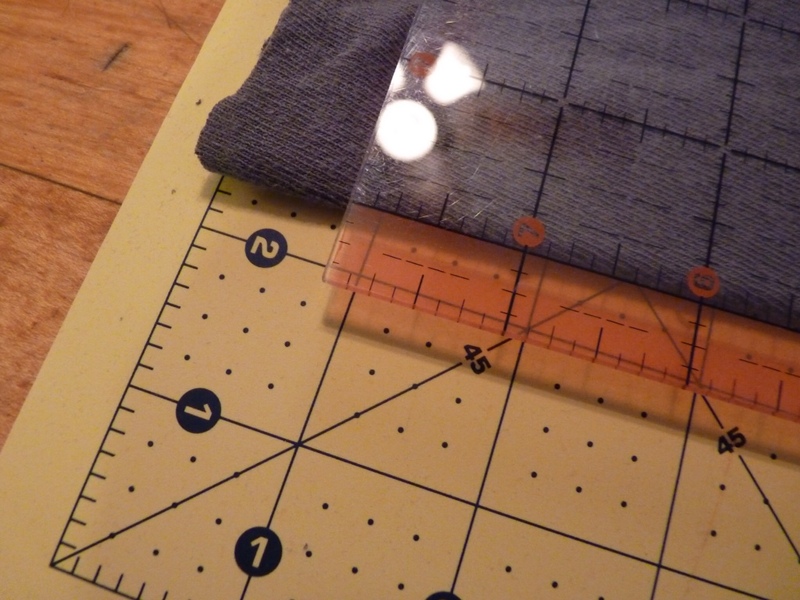 The resulting square, while soft, was very thin as well. It just didn’t seem to be worth all the effort. Maybe I will spin that yarn into a plied yarn, set it, and then try again. I really did like the softness of it, just not the fiddlieness of the weaving. If you have the urge to weave but no room for a loom, or if you just want to see if you might enjoy weaving, this little loom is just the ticket! I thought I would write a short post about the way I am using old t-shirts in my weaving. With five people in this family, we have a fair amount of t- shirts. We usually have quite a few that are getting to the point that they can no longer be worn out of the house, but are still too good to be called rags. 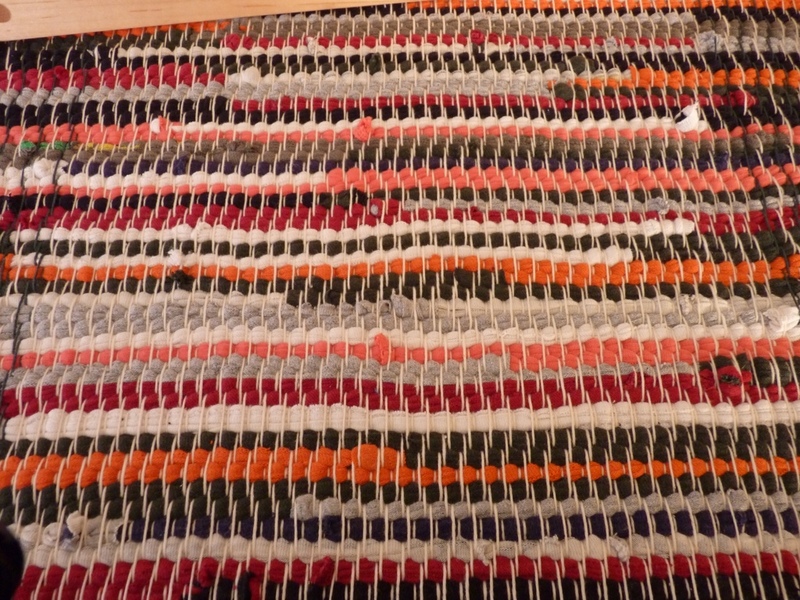 I like the t-shirts I am using for weaving to not have too many holes or bleach spots on them, but a few holes or bleach spots do not show up in the finished rug, and I use those. First, I fold the t-shirt in half and cut off the hem. I don’t use the hem, because it is thicker than the rest of the t-shirt material, and makes a bulkier “stripe” if used with the other strips of material. In previous rugs, I have cut the material into 1.2 to 2 inch strips. Now, though, I am using strips about 3/4 of an inch wide. The smaller stripes are just more appealing to me. I just cut clear across the bottom of the t-shirt, which gives me a loop, or circle, of material. I do this with all the t-shirts I plan to use for a rug. I cut strips like this all the way up to the arm pits,.Then I remove the hems from the sleeves, or start at the elbows on long sleeve t-shirts, and cut smaller loops. Once I get to the arm pits again, I stop. I don’t want to have to sew material together, so that is all of the shirt that I use at this point. It seems wasteful, but this is the most time efficient way for me to get the most done, for right now anyway. I keep that up, picking up the pieces at random, until the ball of “Tarn” as t-shirt yarn is called, is about the size of a softball. I make balls of the strips until they are all gone. My only rule is that if I pick up a loop that is the same color as the one I just used, I have to pick another one. I don’t want two of the same color next to each other. This isn’t an original idea, lots of places sale sock loopers, which are material from the sock manufacturing process, for rugs. I’d rather not have to buy material though, and I like having control over how thick my loopers, and therefore, my rugs, are. I’ve found that having a good mix of darks and lights, as well as having some black in the mix, makes for an attractive rag rug. It kind of reminds me of those scrappy quilts that I love so much. Lots of different colors, and not too planned out. Not to mention, inexpensive! The best thing, though in my opinion , is that once I have woven a holey t-shirt into a rug, it’s fairly certain said t- shirt won’t accidentally by pass my inspection process and end up out in public where it will make people question my parenting choices! !